"The World in an Eye,"
Vol. I, pp. 444-451, Jun. 2004. Vol. 23, No. 3, pp. 704-711, Jul. 2004. In order to obtain a copy of the win32 binary code for VisualEyes, please carefully read the following copyright notice and fill out the request form. 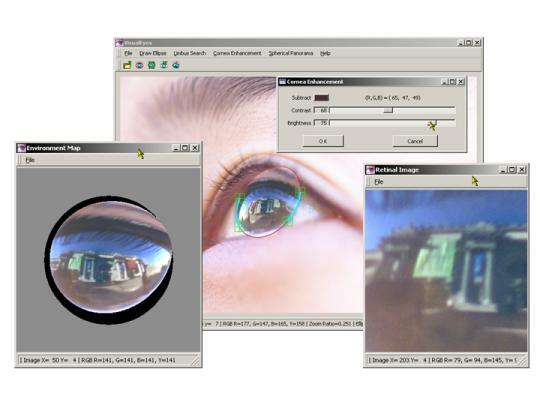 To license the source code for VisualEyes for commercial applications, please contact visualeyes cs.columbia.edu. Permission to use this software solely for educational and research purposes is hereby granted without fee. All other rights, including the rights to distribute, modify, or sell the software, are explicitly reserved by Columbia University. Please contact the authors if you with to make any modifications or additions to the software. This software is provided "as is" and without warranty of any kind, express, implied or otherwise including without limitation, any warranty of merchantability or fitness for a particular purpose. This software uses the FOX Toolkit Library (http://www.fox-toolkit.org). We are distributing the win32 binary code for VisualEyes by physical media (CD-ROM). This request form must be filled by a full-time employee of the requesting organization. Students must provide their advisors' names and e-mail addresses. Please allow 3-5 weeks between request and shipment of the CD-ROM. We reserve the right to decide not to send a copy to the requester without notification.